OTTAWA, May 16, 2017 – VIA founding partners Alan Hart (left) and Graham McGarva (right) have been named as Fellows of the Royal Architectural Institute of Canada in recognition of outstanding achievement in architecture. 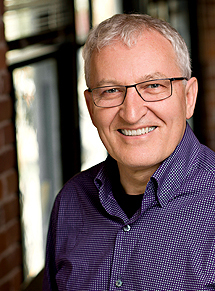 Alan, a founding principal at VIA, leads the firm strategic positioning for all offices in addition to leading many transit and infrastructure projects across the west coast. Graham, a founding principal and now a special advisor to VIA since retiring from the firm in 2016, now focuses on lecturing on community building and the arts, and on his poetry. May is Bike Everywhere Month, a celebration of pedal-powered movement in all forms – whether it’s commuting to work or just enjoying the springtime weather. 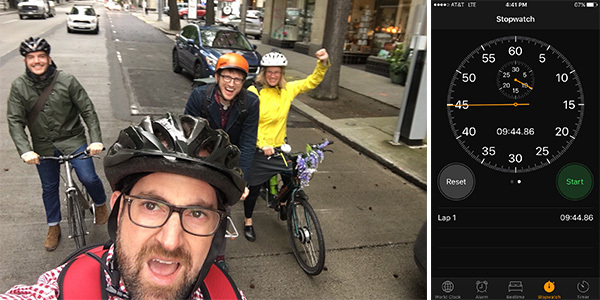 The Bike Everywhere Challenge allows cyclists to track their commutes and encourage friendly competition between their peers. Building off of this momentum, several members of the VIA team participated in the office’s second annual VIA Mobility Challenge. Ready, Set, Go – Taking place during evening rush hour traffic, the challenge was for three teams to race half a mile from the office to a nearby destination via bike, mass transit, and foot. Each team was equipped with a stopwatch and camera to document their journey. Our goal was to see which transit mode could arrive at our destination most efficiently. We then discussed some of the advantages and challenges that each team grappled with. 1st Place – Arriving first was Team Bikes, who took to the streets with their bikes, locks, and helmets in tow. While other teams were able to leave the building immediately, the team needed to first visit the storage room to retrieve their equipment. Upon arrival, they also needed to find a location to lock up their bikes. Despite this, they arrived at our destination at an impressive 9 minutes, 44 seconds. Not accounting bike pick-up and parking, Google Maps estimates this trip taking 7 minutes. Runner Up – Arriving second was Team Mass Transit, equipped with bus passes and a knowledge of bus stop locations and local routes. Limited to traveling on corridors with transit service and contending with potential service delays, they arrived at our destination two minutes later at 11 minutes, 22 seconds. For reference, Google Maps estimates this trip taking 10 minutes. 3rd Place – Arriving last was Team Foot. Despite having the most direct route with multiple options, they faced crowded sidewalks mixing shoppers, commuters, and tourists in all directions. They nonetheless put up a great effort, arriving five minutes later at 16 minutes, 2 seconds. For reference, Google Maps estimates this trip taking 15 minutes. While this was a competition focused on traveling efficiency, there are many other interesting ways of measuring the viability of different transit modes to get us around, especially from environmental and equity standpoints. As our suite of transportation choices expands with new and interactive ways to get around town, we hope to test out other interesting transportation choices next year. Keep your eyes peeled – you may very well see a VIA team of hoverboards, E-bikes, and self-driving cars at our next Mobility Challenge! We are currently seeking candidates for the position of a Full Time (37.5 hours/week) Office Administrator in our Vancouver office. The right individual will have strong communications skills, a high level of initiative, adapt well to change, and work collaboratively as part of several teams including administration, accounting, and IT. We offer a competitive compensation and benefits package in a professional environment. Applicants must meet minimum experience qualifications to be considered for the position. We are currently seeking candidates for the position of Project Accountant in our Vancouver office. Reporting to the Vancouver Controller, the Project Accountant is responsible for setting up projects, reviewing contract documents, preparing invoices with input from the project managers, closing projects when completed, and working on special projects as needed. The Project Accountant will also assist project managers with consultant invoices, project planning, project resourcing, project compliance, and overall financial health and progress of the project. There will also be additional month-end responsibilities and will provide support to both accounts payable and payroll. The right individual will have a strong work ethic and analytical capabilities, a high level of initiative, adapt well to change and work quickly and accurately as part of a team. We offer a competitive compensation and benefits package in a professional environment, including paid holidays, vacation, sick leave, medical/dental/vision, disability, RRSP matching, bonus plan, transportation subsidy, and opportunities for tuition reimbursement. Please email resume to careers@via-architecture.com in PDF format with cover letter/email, and “Project Accountant” in subject-line. Applicants must meet minimum experience requirements to be considered for this position. The AIA Seattle Urban Design Forum recently hosted a panel discussion on ‘The Grand Bargain’, an agreement negotiated between the City of Seattle, developers and housing advocates to implement some of the more impactful recommendations in the Housing Affordability and Livability Agenda (HALA). The presentation and discussion were led by Rick Mohler and Marty Kooistra, and provided an informative overview of this recently passed piece of legislation. VIA’s Dylan Glosecki, Co-Chair of the Urban Design Forum, attended and has detailed the major takeaways from the presentation. During the Urban Design Forum presentation, it was noted that while The Grand Bargain policies are aimed at providing affordable housing, they do not address the lack of family-sized housing units in the City’s newest multi-family buildings. Nor do The Grand Bargain policies address what has been described as the ‘missing middle’ in Seattle: the lack of medium-density townhouses and small apartments that create transitions between single family neighborhoods and the 65’+ mixed-use construction that is becoming characteristic of Seattle’s Urban Villages. Seattle citizens need to continue to voice their support for The Grand Bargain as the City Council votes on its implementation over thenext year. The policy is not yet a sure thing, city-wide. Additionally, to combat housing inequity and ensure our city supports an array of urban family types, citizens must stay engaged in housing policy discussions and encourage the City to pass more of the HALA recommendations and encourage the City to increase their focus on policy that creates family-sized units. The discussion around HALA has been an ongoing topic for years now. We love some good stats here at VIA, .so below we offer our HALA cheat sheet, a more in-depth write up as to the makeup of this legislation, as well as some links to upcoming public engagements. Affordable housing agreement between City, affordable housing advocates and developers. Negotiated by HALA co-chairs, Mayor, Councilmember O’Brien, Housing Development Consortium, Coalition for Housing Solutions. Past attempts focused on controlling developer profit and failed. This attempt focused on generating affordable housing and what policies and land use changes would be necessary to generate affordable housing: upzones, Urban Village expansions and Mandatory Housing Affordability (MHA). Requires developers to build affordable housing on the site of new commercial or residential development or to pay a “Fee in Lieu”. Affordable housing defined as rent-restricted to 60% Area Median Income (AMI) for 75 years. In the UW Urban Center, developers are required to build 9% affordable units on site or pay $20 per sf of built area. 20,000 total 60% AMI units constructed or acquired and rehabbed in next 10 years. 3,700 units from residential MHA. 2,400 units from commercial MHA. $1009 = 60% Area Median Income (AMI) household spending 30% of income on rent. Has increased 35% in last 5 years. 45,000 households spend more than 50% of their income on housing. In August 2016, the Seattle Housing Levy was approved, dedicating $290 million towards affordable housing. Passed with 70% voter approval. Costs the average homeowner $122 per year over 7 years. Already in place and has been successful at incentivizing 80% AMI units in Seattle. The Grand Bargain is a compromise between multiple stakeholders to implement the Mandatory Housing Affordability program (MHA) in Seattle’s Urban Villages. The agreement is unprecedented in Seattle history. Never before have Seattle developers and housing advocates been able to compromise on a policy with the potential to provide affordable housing at such a large scale. By implementing MHA, developers contribute by building affordable housing onsite or paying fees that fund affordable housing elsewhere in the City. To put the MHA requirements into effect, the City is making zoning changes that allow for more development in the City’s Urban Villages, offsetting the costs to developers for providing affordable housing. However, The Grand Bargain is a tenuous agreement that could fall through should any of the primary stakeholders become discontent and decide to litigate. The major pieces of The Grand Bargain are the MHA program, upzoning in Urban Villages and the expansion of several Urban Village boundaries. The City Council will be voting on the implementation of The Grand Bargain policies in several stages. 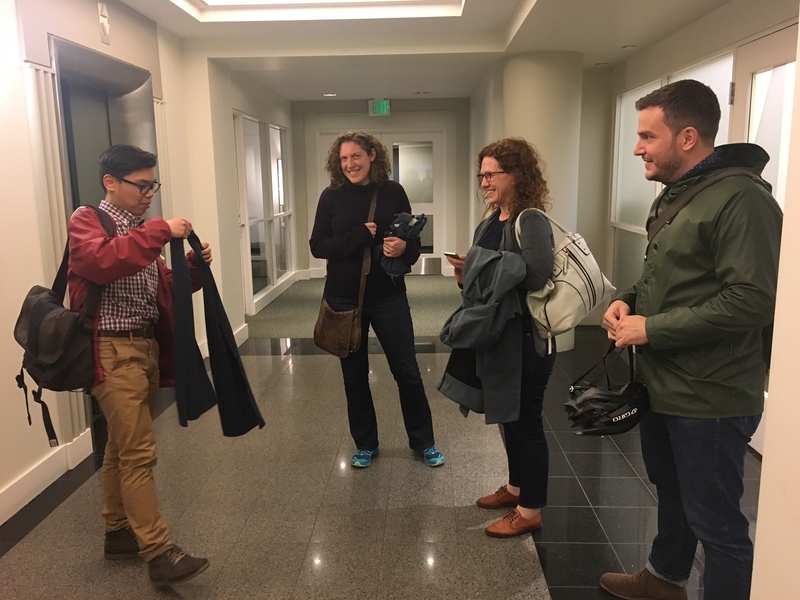 The City is currently conducting a series of public outreach workshops where Seattle citizens can share their voice to shape how the proposed policy will impact their specific neighborhood. The University District is the first Urban Village in which Grand Bargain policies are being implemented. The City Council unanimously passed the zoning changes in the University District in late February. 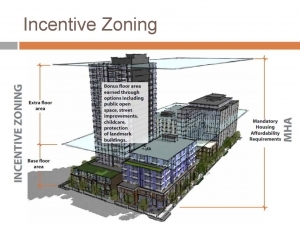 Later this year, the City Council will consider implementing Grand Bargain policies in the Downtown and South Lake Union Urban Villages, followed by the International District and 23rd & Union-Jackson. The City Council will likely vote on a city-wide Urban Village rezone to implement Grand Bargain policy in the remaining Villages in 2018. Experienced with high scrutiny public projects, outreach, and preparation of graphic presentation material. Please submit cover letter, resume and work samples in PDF format (no more than 3MB please). Email with “Urban infrastructure Architect” in subject-line. Send to: Kate Howe, Director at khowe@via-architecture.com. No phone calls or office visits please. We are also seeking a part-time Receptionist/Office Assistant (22.5 hrs/week) in our Vancouver office. The right individual will have strong communications skills, a high level of initiative, adapt well to change, and work collaboratively as part of several teams including administration, accounting and IT. Salary is commensurate with qualifications and experience. We offer a competitive compensation and benefits package in a professional environment. Please email PDF resume with cover letter with “Receptionist/Office Assistant” in subject-line to careers@via-architecture.com. No phone calls or office visits please. VIA Architecture is a strategic architectural and planning firm with offices in Vancouver BC, Seattle WA and San Francisco CA. We are a studio based practice leading a variety of local projects including transit systems design, mixed‐use infill architecture, community and downtown plans and urban sustainability strategies. We are currently seeking candidates for architectural positions with transit/urban infrastructure experience for our Vancouver office. These people will supplement and work within our multidisciplinary team to provide comprehensive architectural services for public transit, urban infrastructure and other commercial projects. We are interested in exceptional candidates with strong analytical, communication and technical skills who are passionate and involved in community building at all scales. Proficiency in REVIT, AutoCAD & Sketchup highly desired. Fluency with digital model rendering, Adobe and other graphic programs a plus. Skilled in the preparation of graphic presentation materials, technical architectural detailing, and coordination of overall project documentation packages. Experience with the technical coordination of collaborative design disciplines and 3‐dimensional resolution of technical issues. , Integrated project delivery experience a plus. Ability and experience with organizing, tracking and implementing project data, directives and design, tender and construction document production, consultant coordination and other support roles to the Senior Project Architect. In depth knowledge of the BC Building Code. Ability to delegate supervise and mentor junior staff members. Please email resume in PDF with cover letter/email, and “YourName_PositionApplyingFor” in subject‐line, attention Charlene Kovacs, ckovacs@via‐architecture.com. Salary is commensurate with qualifications and experience. Benefits include medical/dental insurance and retirement funds contribution matching. Please email resume to bgeiss@via-architecture.com in PDF format with cover letter/email, and “Controller” in subject-line. No phone calls or office visits please. Applicants must meet minimum experience requirements to be considered for this position. We offer a comprehensive salary package with benefits commensurate with experience/skill level. The station is an elevated center platform designed with sustainability in mind, featuring a rooftop photovoltaic array to generate close to 3% of station’s annual power needs and a rainwater harvesting system. Construction on the station began in May of 2013. 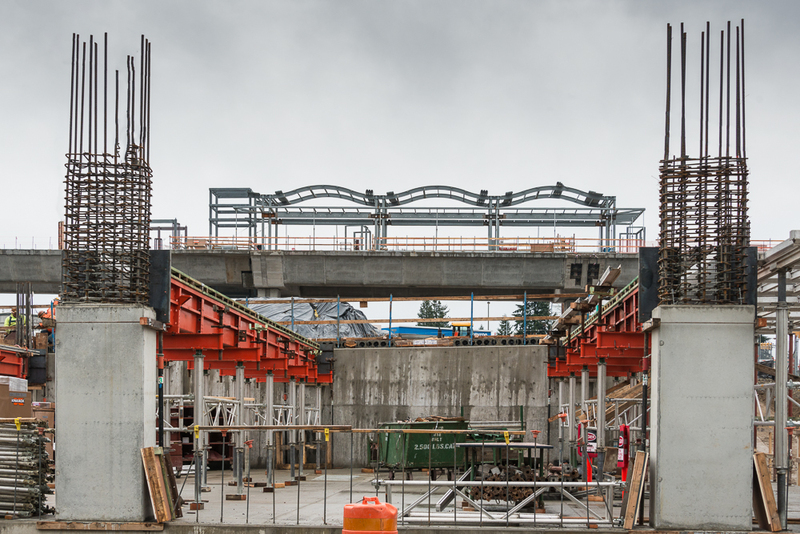 Train testing has begun and the station is slated to be operational in September of 2016.